Good morning! The Cosmetic Fair opened a few days ago and Glam Affair has a version there for sale of it’s Mokatana skin in the tone – Artic. The make up’s in this collection are quite striking and beautiful. My eyes are from Ikon, my jewelry set is from Cae for the Rack starting tomorrow in Promise.. you can snag this beautiful set for 200L for one day only! My hair is from Lelutka. 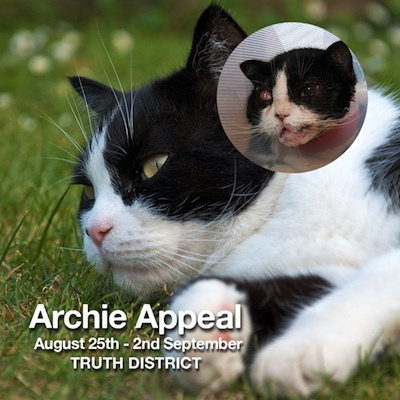 I went and checked out the Archie Appeal Event for Gospel Voom’s Beloved cat Archibald. There are many designers showing support with items being sold to benefit Archie’s treatment which will easily get up into five figures.. and if you have ever had a pet that you just loved so much you know that this is a nightmare. If we could all pull together a little right now for Gos and Archie as a community to support a Pet and Pet Owner that has come to mean so much to the SL community any little bit would help. There are even donation kiosks’s available at the event. For my post I am wearing.. not much.. because the Entire Gos store on the Truth District sim is half off.. and you if you are going to go naked you may as well be in Gos shoes. The stacked poses that I am using are from oOoStudios and they have several different poses in them and the prop is mesh and very easy to adjust. I had a lot of fun with these poses. The other designers who are also taking part in this event are: !bang, .emm, *elymode*, A.D.D. Andel, bent!, wetcat, Eclat, Embody, exposeur, Gos, ooo studios, picture this!, Prime, Somnia, and Status. I believe more may be added.